Finally, a film grant that aims to support local works beyond the commercial value they bring and that looks into their artistic and cultural value as well. The Singapore Film Commission launched the New Talent Feature Film Grant (NTFG) to support film directors to produce their first feature films in a variety of genres, including those of artistic and cultural value, such as documentaries, festival-oriented works, and films in non-English languages (i.e. Chinese, Malay and Tamil). The NTFG pays up to S$250,000 or 100% of the production budget (whichever is lower) for each feature film with at least 40% of the grant to be used on Singapore spend. Certainly good news for filmmakers and everyone else in the food chain! SINdie caught up with the first batch of recipients (there were 8) of this grant to give you a glimpse of what to expect in the coming year. Here is the first Q and A with Ms Tan Ai Leng who will be making her first feature 'Sinema Paradiso' (working title). 1. Could you tell us a bit more about this film that you will be developing? "Sinema Paradiso" (working title) is a dreamy slice-of-life story about a Malaysian village boy chasing after his dream in the bustling movie industry of Singapore during the 1950s. It revolves around the theme of love found and love lost, and the message that true love always remains, just like a movie that never ends. 2. As funding is slightly less of an issue now, are you hoping to push the boundaries--stylistically or technically--with what you want to achieve on this film, which you couldn't on others due to budget constraints? Anything bold the audience can expect? "Sinema Paradiso" is a period piece, and Production Design and Art Direction are very important to make the movie "look" real. Also, music is very important to bring out that era's "feel". I wouldn't say there's going to be anything "bold" for now, but at least I am assured of better quality in terms of the "look & feel" of the movie. I believe there are many great Singaporean stories to be told so I don't think NTFG's thematic requirement restricts our vision as filmmakers. In fact, we need to build an identity for our films, and NTFG is just the right channel for this. With MDA's support, investors are more willing to put in their money. Two years ago, I came across a local novel called "Rice Wine and Dancing Girls" by Wong Seng Chow. It depicts the story of the author's father who was a roving cinema manager in Singapore and Malaysia during the fifties, and I became thrilled about the idea of developing "Sinema Paradiso" as a celebration of our nation's cinema - spelt with a capital "S". 5. Your feature film topic also touches on the idea of crossing the Straits like your short film Across the Straits. Can you share a bit more about your fascination with exploring the relationships between the 2 places? 6. 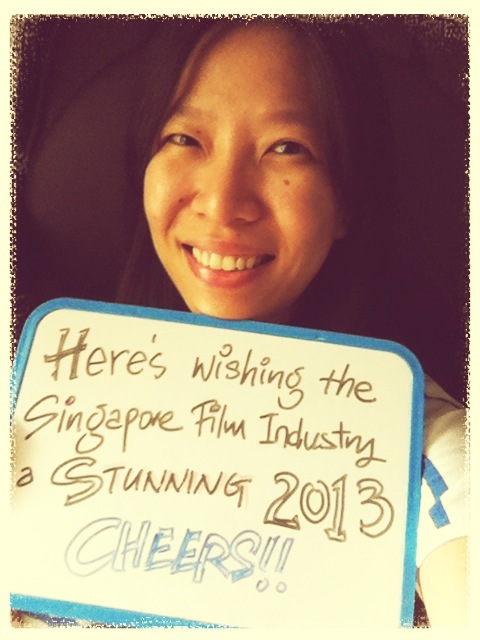 What is your wish for the Singapore film industry in 2013? I wish the Singapore film industry a stunning 2013 with more quantity and quality local content films that will travel beyond the region!